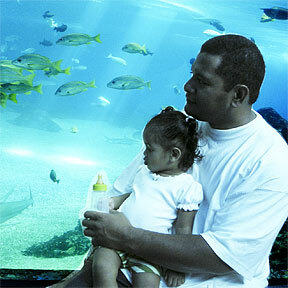 BEST FATHER'S DAY PRESENT: Maui prison inmate Paea Tasini held his 1 1/2-year-old daughter, Tui, yesterday during a special visit to the Maui Ocean Center to celebrate Father's Day and his graduation from a correctional parenting program. Westpac believes that existing fishing practices are consistent with the new isle monument. George Naope helped found the Merrie Monarch Festival. Talib Kweli says being true to himself artistically allows him to develop his craft. The mighty mite from Moanalua said he would continue to use his driver at Winged Foot in today's second round. It is Hilton's fourth timeshare development in Hawaii and its most luxurious to date. Establishing the Northwestern Hawaiian Islands as a national monument will provide strong protections for the ecosystem.